Karissa thinks its the coolest thing to be sick so she can eat in the bedroom on a "trail" (tray). This is proof that blogging has made ninnys of us all. 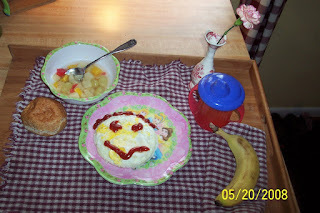 Who would have dreamed 10 years ago that we would actually take the time to stop and take a picture of something like a sick kid's breakfast tray? It think it's a good thing. It helps me to capture the moments every day in a new way. What a sweet thing to do! That's something I've never done for my kids. I remember your mom doing this when I was young and spent the night at Deanna's slumber parties. She tolerated us rowdy girls being up half the night and then brought us warm croissants with yummy fillings for breakfast on a tray. See, that's why it's not silly to post such things. We give each other ideas and it's fun!